Pros: The Lotus Travel Crib is lightweight and converts to a backpack that can be taken on planes as carry on. It is easy to assemble. It can also be used as a play area. There is an unobstructed view of child. Cons: The Lotus Travel Crib has a thin mattress which does lie flat. There are many velcro tabs. The Lotus Travel Crib and Portable Baby Playard is a great, flexible crib that can be used anywhere. It is lightweight, easy to transport and can be set up and put away in less than a minute, making this an excellent choice of a travel crib for your child. The following video shows you how small this crib is to transport and how easy it is to assemble and dissemble. This Lotus pack and play can also be used as a playpen. When assembled, the mattress is 42″ x 24″ and the crib is 25″ deep. When packed up, it is only 24″ x 11″ x 7″. The breathable mesh on all sides allows for an unobstructed view of the child. It’s one of the best travel cribs on the market. Parents who are looking for a great, versatile travel crib. This crib is suitable from birth until the child no longer needs a crib. It is compact and easy to use. Another big plus is that it comes with a fitted sheet, mattress, backpack and instruction manual. The Lotus Travel Crib and Portable Baby Playard is very easy to use. It takes less than a minute to assemble and disassemble. This process is demonstrated in the above video. It is also easy to clean – All surfaces can be wiped clean with a cloth. The fitted sheet is machine washable. This crib folds up into a bag which can be worn as a back pack. It is very compact when folded. It is only 11 pounds and can be carried onto flights as hand luggage. The backpack style makes it very easy to carry around at the same time as carrying a child. In our Lotus Travel Crib review, we found a crib that is narrow enough once assembled that it can be carried through doorways. The mattress is very thin which can lead to concerns about the comfort of the baby. However, children seem to love this travel crib and have no problems sleeping in it. The mesh walls make it very breathable and pleasant within the Lotus crib. All fabrics are soft and pleasant. It can be used from birth until 3+. 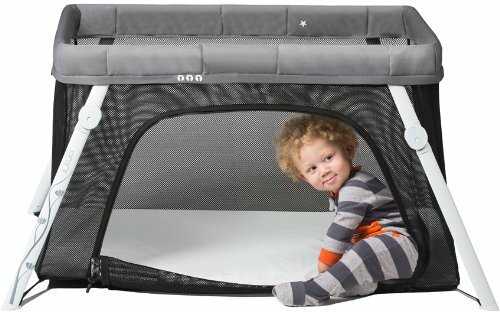 There is no weight restriction on this travel crib since the mattress is on the floor. It is 42 inches long. It meets all safety standards and is 16 CFR 1221 + ASTM F406-13A certified. There are no PVC, Phthalates and Lead used in its construction. The sides of the crib are made with breathable mesh which goes all the way down to the mattress. The Lotus playard is sturdy when set up. As always, follow safe sleeping guidelines when using this crib. 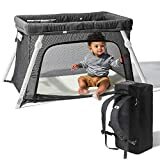 It can be converted into a bassinet with an optional accessory for babies, and can also be converted into a great outside option with a fun shade or a mosquito net. It comes with a fitted sheet which is secured to ensure a baby can not remove it and become tangled. You can also buy more fitted sheets. The ends of the mattress do not lie completely flat on the floor of the travel crib until there is a child lying in the crib. There are quite a few velcro tabs to set up which can be tedious when first starting to use it. Our Lotus Travel Crib review revealed an excellent choice for parents who want a flexible travel crib that folds into a backpack for travel and that is suitable from birth. We are big fans! Still unsure which crib to buy? Check out the our buying guide.